Just over a year ago, Google started a help thread for Panda victims where they can go post their site's information and seek advice from other webmasters and maybe Googlers. The thread had reached almost 9,000 posts, probably a record for the forum, over the course of the year and saw no sign of slowing down. But when Google migrated to the new forum system this weekend, the thread was killed. Only about 20% of the posts are in the main thread now, Google lost the rest or they are split off into other threads, hard to find. You can see the what is left of the thread over here. I was a little upset for two reasons. The first is that I wanted to do a post for when it hit 10,000 posts, which would have been in the next few months. The second reason is because Googlers told me that every single time someone posts in that thread, it goes to their email account and they read each and every post. Now what? It looks like the particularly long threads were split up for migration. The content is still there, you can find it in search :). It's great having your feedback, even (and especially) if it's critical. Please continue posting, feel free to start a new thread if you'd like. This went against what Google suggested a few months ago, saying to use that thread for Panda related help and not start a new thread. But I guess with the new forum upgrade, this is the new advice. 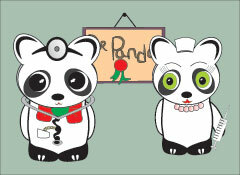 Image credit to ShutterSock for Panda doctors.